Where the overall Best signal level at every point from a selected number of fixed units to a defined mobile unit is plotted. Next, the Cartesian Coverage pane is opened, where the three 'Mobile' Units are selected for the plot, using the Hand Held Unit as the mobile unit (to be used as the moved reference), and the Base Network selected. At this stage it is possible to select the Background color to represent these fixed units (for Best Unit plots), which is also shown on their labels. 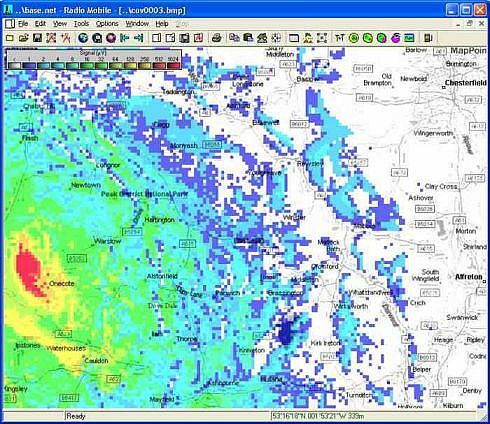 The 'Save raster data to file' checkbox has also been set to make the plot information available later without repeating the calculations, and 'Save coverage pictures in Frames directory' to save the individual coverage plots. 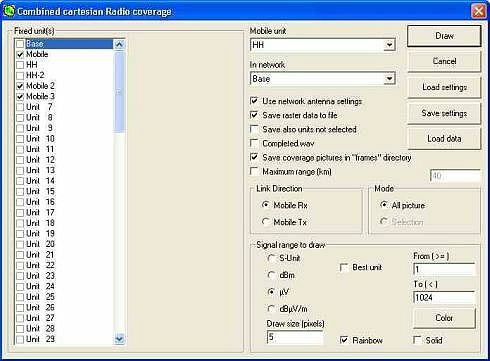 Clicking on Draw causes the three coverage plots to be drawn and saved, plus the 'Combined best signal available' plot which is held on screen and can be saved as a new picture. 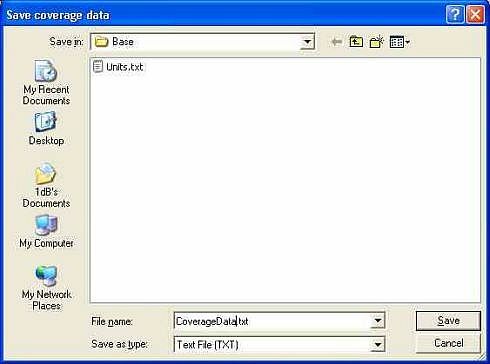 This prompts the saving of the Coverage Data file to a selected location. where the high local signal levels around all the Mobile Units can be clearly seen. The individual plots for each Unit can be recovered Using 'File > Open Picture' (or the toolbar icon), and navigating to the latest numbered 'Frames' directory. For any area of interest on the Combined coverage picture, a click at the location generates the cursor cross wires, and by cycling though the coverage panes the best signal strength and Unit can be determined for this location. 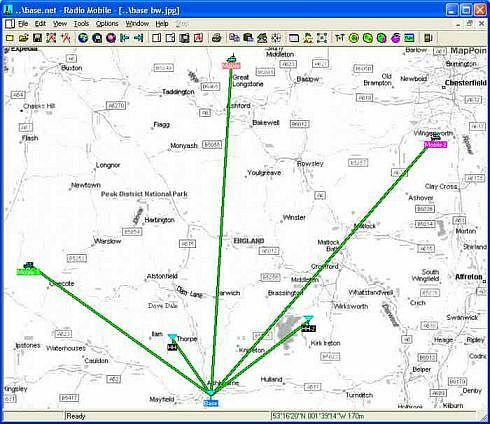 The above process can also be carried out on a zoomed area of the map for a 'Detailed Area Coverage' plot.